Media reports estimate that 4,000 migrant workers in Qatar will die in the lead-up to the 2022 FIFA World Cup because of the substandard working and living conditions imposed by Qatar's migrant worker program, otherwise known as the kafala system. In Canada, the rights to broadcast that event belong to Bell Media. As many as 4,000 people in Qatar are on pace to die before the 2022 FIFA World Cup because of the substandard working and living conditions imposed by the country’s migrant worker program, otherwise known as the kafala system, according to reports by the Guardian and ESPN. 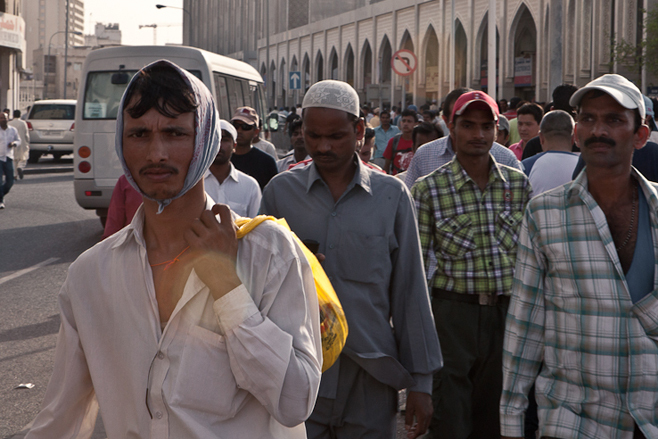 Over 1,000 migrant workers have died since Qatar won the right to host the event in 2012. Nearly half of the country’s 1.5 million migrant workers are from India and Nepal, while the Guardian recently reported that North Korean “state sponsored slaves” are being used in the system as well. And he is right. Widespread allegations of corruption against FIFA and repeated documentation of slave labour conditions in Qatar haven’t stopped media companies from lining up to pay top dollar for World Cup broadcast rights. FIFA has racked up at least $1.85 billion from licensing television rights for its 2015-2022 events. In Canada, those rights belong to Bell Media, who extended their hold on FIFA broadcasts to 2026 in February. We asked Bell if they were at all concerned about paying for the rights to an event that could contribute to the deaths of thousands of workers, one that Amnesty International’s Head of Refugee and Migrant rights has said “is built on forced labour and exploitation.” We asked them if they have raised the issue of the kafala system with FIFA and if they intend on airing the 2022 World Cup if, in fact, thousands more migrant workers die in the lead-up to the event. Except, two days after FIFA’s press release, Qatar told the Associated Press that they have no timeframe for reforming the kafala system. Qatar’s government has been promising reforms to the system for over a year, and has been criticized by Amnesty International and Human Rights Watch for failing to implement them. FIFA, through all of this, has offered nothing but weak rhetorical gestures. “Despite many promises over the past several years, Qatar has not made any significant change to its labour laws, and even the often recycled promises to ‘reform’ kafala would still maintain the system of modern slavery imposed on migrant workers – if those ‘reforms’ are ever introduced,” Sharan Burrow, the General Secretary of the International Trade Union Confederation (ITUC) tells CANADALAND. Last year, ITUC issued a damning report about labour standards under the kafala system, in which they lay out the evidence to support the 4,000 death pace in the lead-up to the World Cup. Migrant workers congregate near Bank Street in central Doha on Friday, the weekly day of rest. Some 1.19 million of the 1.26 million people employed in Qatar come from abroad. Host nation controversies, of course, are nothing new to international sporting events. The 2008 Beijing Summer Olympics led to calls for boycotts from activists because of the Chinese government’s human rights record. Coverage of the 2014 Socchi Winter Olympics were often overshadowed by the human rights record of Vladimir Putin’s government and its military interventions in Ukraine. Traditionally, narratives in favour of going ahead with events in controversial host nations have hinged on the argument that the games themselves are symbols of international civility and respect that transcend the actions of governments. But Qatar is different. Bell Media will not be broadcasting an international sporting event that takes place in spite of slave labour, it will be broadcasting one that takes place on sites built by it. We asked FIFA if any of the money it takes in, including the money from broadcast rights that Bell Media has contributed to, goes to pay for infrastructure costs in the host country. A FIFA spokesperson directed us to an FAQ about its latest financial statements where it is noted that “significant investments were made in public infrastructure” at last year’s Brazil World Cup. Asked if they intended on participating in qualifers for the 2022 World Cup, Canada Soccer would not answer. “The Men’s National Team is currently focused on qualification for the 2018 World Cup in Russia,” said a spokesperson. What’s all too clear is that, without aggressive intervention or boycotting from FIFA’s sponsors, its broadcast partners and national football associations around the world – in other words, the people FIFA makes its money off of – the pace of migrant deaths in Qatar will continue unabated. Over 1,000 people are already dead. Qatar’s government has no timeline to fix this problem, and FIFA has given no penalties for its repeated intransigence. At this point, deference to FIFA’s press releases is not an excuse for anyone involved.